There is so much paperwork involved in starting a business, it’s nice to know that there are accessible internet sites that can relieve some that stress. This application for employment template will allow you to check this off of your ‘Forms-To-Have’ list. The legality issues of what questions are permissible has already been done for you, just download, customize, print and save. When you are setting up a business, you are always looking for ways to keep your overhead low and still produce quality results. The tasks that you can do for yourself allows you to save money in one area, while spending money where necessary, to get the job done. 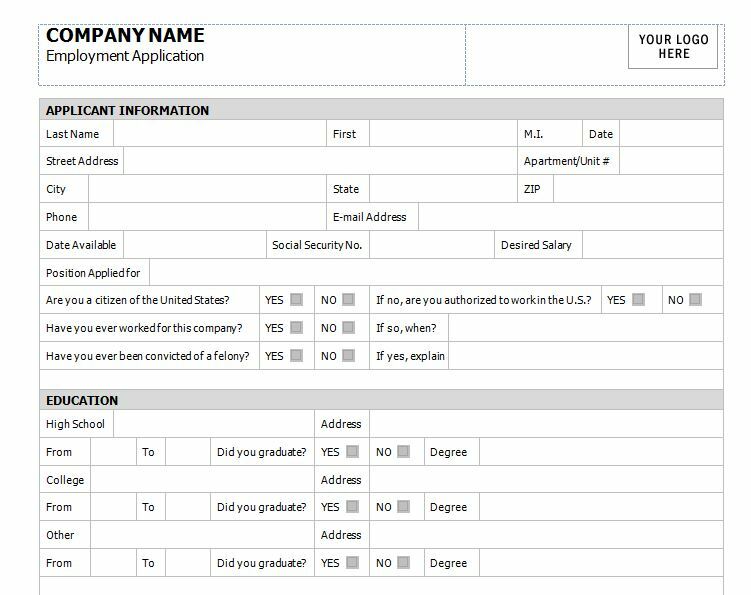 Downloading this free and easy-to-use application for employment template is a step in the right direction. It is already formatted into sections that include applicant information, education, references, previous employment and military service. This template is a two-page document that allows plenty of space for the applicant to answer all the pertinent questions to be considered for hire. The application for employment template allows for you to customize it with your company’s logo and business address information. And once that is completed, you can print an original and copy as many applications as you need. Because the truth is, for every one person that you hire, you will have to interview at least 20 people. Having a master of the completed application document is key. This will allow you use less printer ink without sacrificing the quality of the copies. Always make copies from the master, it is cheaper to use a copier machine than it is to print from the printer. When you are away on business trips keep a scanned copy of the application for employment form in your smartphone or laptop. You may meet someone who has a reference or be a potential candidate for hire, you can then email them the application in less time than it would take for you to get back to you office.